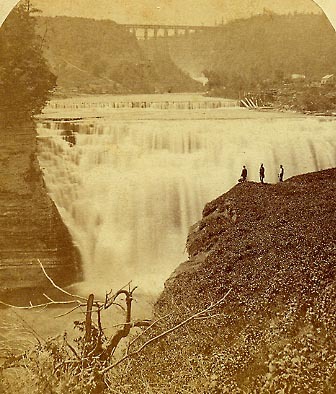 "Middle Fall of Genesee - Portage Bridge in Distance." This view shows the Middle Falls from the northwest bank of the gorge. The three tourists enjoy a breathtaking view of the falls near what is now an overlook. The Portage Wooden Bridge is in the background, and to the left, running under the bridge, one can just make out the cut of the Genesee Valley Canal. In the river, just above the falls, one can see the remnant of the mill dam. When this image was taken, Mr. Letchworth had been in the Valley for about a decade. Although the major changes - the burning of the mills and the destruction of the lattice bridge (see image 38) were due to natural causes, Mr. Letchworth's dream of restoring the natural beauty of the area is clearly taking shape.